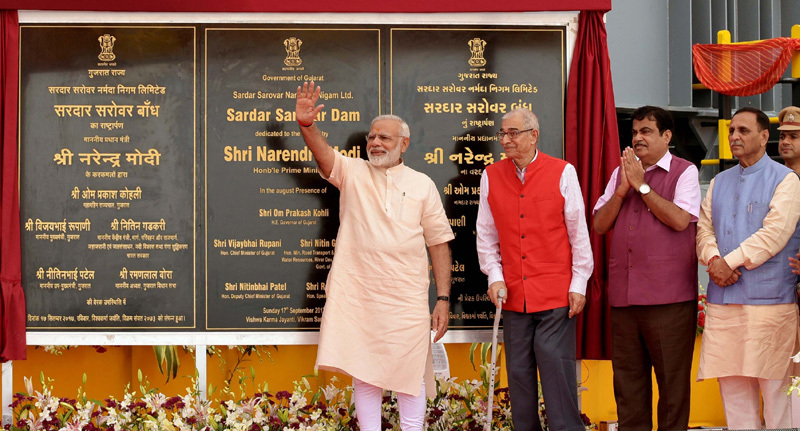 Prime Minister Narendra Modi dedicated to the nation the Sardar Sarovar Dam at Kevadia in Narmada district of Gujarat on 17th September 2017. Later, addressing a public meeting at Dabhoi in Vadodara district, the Prime Minister said lack of water resources has been a major factor in slowing the pace of development. He said the Project will be help full to bring prosperity among the people in new India. Mr Modi said through this project the Narmada water will not only benefit the farmers Gujarat but also those from Maharashtra, Madhya Pradesh and Rajashan. Mr Modi said, Sardar Sarovar Dam faced so many obstacles, but they were determined that the project will go on. It has been a wait of 56 years for the project to be completed since 1961 when its foundation was laid. The project is expected to be a lifeline to the farmers of Gujarat in terms of irrigation. In 1996, the Supreme Court placed a stay on the dam's construction over the issue of displacement of people from affected areas but granted permission for construction in 2000. The height of the dam was recently raised to over 138 meters increasing its usable storage capacity to over 4.7 million acre-feet. The dam will benefit 15 districts and 19 lakh hectares of Gujarat. It will benefit up to 4 crore people by supplying drinking water to villages and towns through an elaborate canal and pipeline network. The dam, being constructed on the Narmada river, will be the second largest dam in the world.